For her latest culinary adventure, restaurateur Karen Waddell brings a little bit of Bali to America with launch of her plant-based dessert, Reveri. Ice cream will never be the same. When the award-winning foodie and restaurateur Karen Waddell returned to America after nearly twenty years building a culinary empire in Bali, she experienced a reverse culture shock. She couldn’t believe the explosion in childhood obesity and knew she had to do her part to reverse it. She’s determined to get a generation of kids off added sugar, and she’s starting with ice cream. Reveri, the plant-based dessert Waddell launched in 2017, has hit #1 in sales in key retailers in Southern California, and has been consistently named among the top vegan products in the marketplace. Why? Because Reveri delivers the sweet taste and rich mouthfeel of super-premium ice cream, yet contains no dairy, added sugar, sweeteners, or fats, and averages only 82 calories for a 4-ounce serving. All four flavors are whole foods disguised as delicious ice cream. Waddell pursued her culinary passion in Bali, where she lived for 28 years. In 1997, she opened her first restaurant, which soon led to four more on the island. Sourcing from her own organic farm, her menus featured fresh, delicious fare that kept customers coming back year after year. Her pledge to not only delight, but also nourish the crew of Eat, Pray, Love won her the catering contract when the production was on location in Bali. “You’re not going to stop people craving ice cream,” Waddell said. “I feel good about the fact that anyone can eat Reveri and feel great afterwards. Your body is the processor. You don’t need processed food,” Waddell concluded. 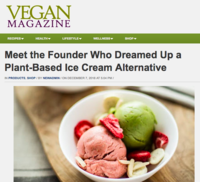 Please visit www.Reveri.com for more information on this plant-based alternative to ice cream.